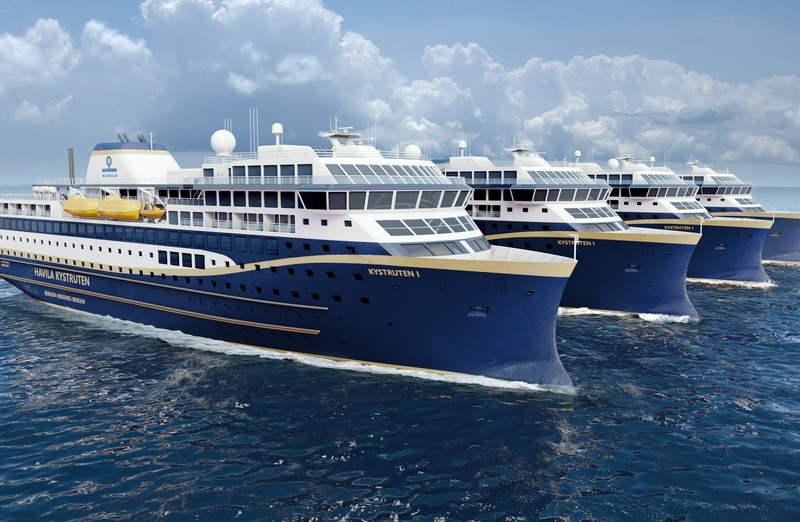 From January 2021, Norwegian ship owning company Havila Kystruten AS will operate four environmentally-friendly Ro-Pax vessels of Havyard 923 design on the coastal route between the cities of Bergen in south western, and Kirkenes in northern, Norway. The company has contracted Spain’s Astillero Hijos de J. Barreras shipyard to build two of the cruise ferries and Turkey’s Tersan yard to construct the remaining two. Rolls-Royce Commercial Marine will provide a fully integrated LNG power and propulsion solution to all four ships. This includes two LNG fuel tanks with process system, and control and safety systems, four Bergen gas engines, main propulsion thrusters of type Azipull with Permanent Magnet (PM) drive motor, PM tunnel thrusters, and stabilizers of type Neptune 200. The main propulsion thrusters with integrated PM motors are developed in close cooperation with ship designers, to ensure optimal integration with the hull. The energy efficient tunnel thrusters allow for a slimmer hull shape due to their narrow design, which fits well with the project’s overarching goal of energy efficiency and low emissions. The low noise and vibration levels of the PM tunnel thrusters combined with the roll damping effect of the stabilizers will benefit the comfort of both passengers and crew. The LNG fuel system from Rolls-Royce will supply Bergen gas generator sets. Each vessel will have two engines with nine in-line cylinders, and two with six cylinders. The engines can operate on variable speed to reduce both fuel consumption and emissions. The chosen Bergen engines series reduces total greenhouse gas (GHG) emissions by about 20% compared to a similar diesel engine, and is IMO Tier 3 compliant. Moreover, two separate LNG fuel systems are designed in cooperation with the ship owner and include flexibility to bunker both tanks from the same side of the ship, as well as the option to supply the front and aft machine rooms from both tanks. This ensures high redundancy and flexibility during operation. In May 2018 the Norwegian government awarded 11 new licenses for the renowned passenger and cargo route from Bergen in the southwest to Kirkenes in the north. Havila won four of the 11 licenses. The new agreement starts in January 2021, and a key requirement from the Ministry of Transportation has been to reduce CO2 emissions.